Libby Purves meets former archbishop of Westminster Cormac Murphy-O'Connor, conservator Lucy Branch and Hoagy B Carmichael, son of musician and bandleader Hoagy Carmichael. Lucy Branch is a conservator. 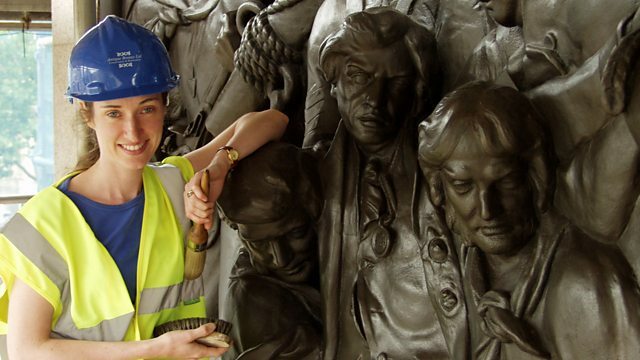 She specialises in the conservation of sculptural and architectural bronze and contemporary materials. She has worked on high-profile projects including Eros, Nelson's Column and the Queen Victoria Memorial. She has led the conservation work on some of Britain's best known contemporary sculpture including Ron Arad's The Big Blue and Wendy Taylor's Conqueror. Her novel, A Rarer Gift Than Gold, is published by Clink Street. She is director of the company Antique Bronze Ltd.
Hoagy B Carmichael - son of the composer, singer, musician and bandleader Hoagy Carmichael - is co-producer of Stardust Road, a forthcoming musical which celebrates his father's work. Hoagy Carmichael studied law before going on to write hit songs including Stardust, Georgia on My Mind and The Nearness of You. Stardust Road is at St. James Theatre, Palace Street, London. Cormac Murphy-O'Connor was cardinal archbishop of Westminster from 2000-2009. Born to Irish parents and brought up in Reading, he was 15 when he announced he wanted to be a priest. He studied at the English College in Rome and was ordained in 1956. The following year he began his ministry as a priest in Portsmouth. He was ordained bishop of Arundel and Brighton in 1977. In his memoir, An English Spring, he writes about his role in the Church during periods of turbulence and change. An English Spring is published by Bloomsbury. Eddie Pepitone is a US comedian and actor. Born into an Italian-American family in Brooklyn, he took up improvisation in his teens and later became a full time stand-up comedian, leaving the east coast for Los Angeles. He has appeared in many US television shows including Arrested Development; Flight of the Conchords, Monk and ER. Eddie Pepitone's show, What Rough Beast, is at the Soho Theatre, London.